For lunch one day, I headed to the 'Bux and sated my craving for a cinnamon dulce latte soy latte. Next to all the pastries, I saw this and had to partake. So this bar was a little crumbly and a bit small, but notice the raw-ness, gluten-free-ness, dairy-free-ness, and just purity in a bar. It's actually a good supplement to create a meal with a latte... I felt very healthy and clean just eating it. The toasted quinoa was crunchy and protein-packed, while the seeds added enough chew to make me feel like I was eating something a little more decadent. And yes, I was reading that book next to the bar. Definitely a fun lunch hour. 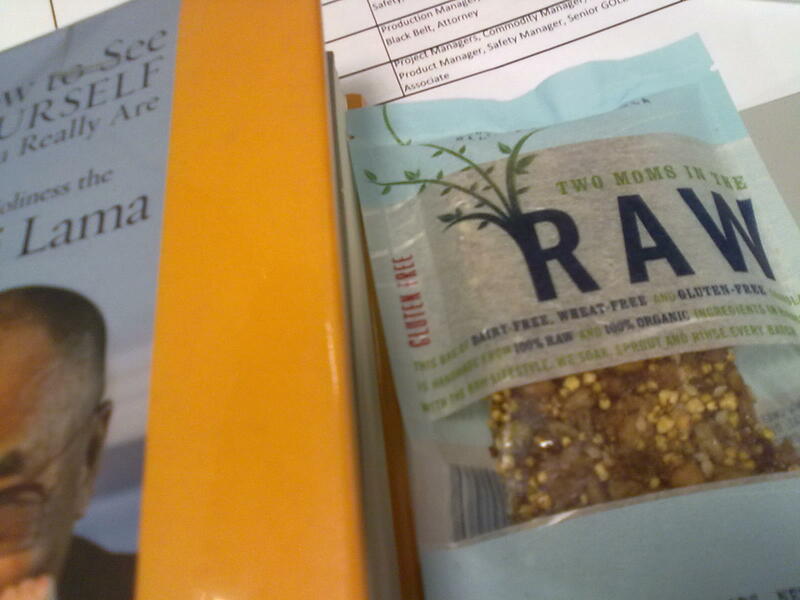 I know that the "Two Moms" brand makes a lot of other raw food, so I will keep an eye out for them. I love bars and coffee for a snack. Bars that are quality like that? Even better!